Nature, 2017, 550(7677):534-538. Bortezomib (PS-341) purchased from Selleck. Indisulam dependent degradation of RBM39 can be blocked by bortezomib, a proteasome inhibitor. Cells were pretreated with indicated concentrations of bortezomib for 2 hours, followed by 6 hours of treatment with 2 μM indisulam. The effect of bortezomib is attenuated in a bortezomib resistant cell line. Science, 2017, eaal3755. Bortezomib (PS-341) purchased from Selleck. Wild-type mice fed as indicated were injected with vehicle (10% DMSO, pH 7.4 PBS) or bortezomib (5 mg/kg bodyweight). Livers were collected 16 hr later for quantitative PCR analysis of indicated genes (n = 4–5). *p < 0.05 bortezomib effect and #p < 0.05 Chol-Diet effect by two-way ANOVA. Cell, 2017, 171(5):1094-1109. Bortezomib (PS-341) purchased from Selleck. Effect of different proteasome inhibitors on dysferlin expression and on membrane resealing in cultured primary myoblasts. Primary myoblasts from patient 2 harboring a homozygous Arg555Trp DYSF mutation that were treated with the indicated amounts of bortezomib for 24 hours. Western blots of protein extracts were stained with anti-dysferlin antibodies and with anti–a-tubulin antibody as loading control. Sci Transl Med 2015 6(250), 250ra112. Bortezomib (PS-341) purchased from Selleck. Pharmacologic inhibition of the proteasome blocks proplatelet formation in murine and human megakaryocytes. Human megakaryocytes were pretreated with vehicle or bortezomib, and megakaryocytes producing proplatelets (PP) were examined. Shown are representative transmission images and representative confocal images with wheat germ agglutinin (WGA; red) and phalloidin (green) staining. Scale bars: 50 um. J Clin Invest 2014 124(9), 3757-66. Bortezomib (PS-341) purchased from Selleck. Effects of NF-kB inhibition on cell proliferation and apoptosis in Foxp3cKO prostate. A. Top left panels: Representative H&E staining of PIN lesions in ventral prostates of 60-week-old PBS- or bortezomib-treated Foxp3cKO littermates. Scale bar, 50 祄. Right graph: Quantification of Ki67-positive cells identified by IHC analysis (bottom left panels) as a measure of cell proliferation, performed with Scion Image software. Horizontal lines represent the average values. The p value was determined by two-tailed t test. B. Representative western blots showing p65 and nuclear p65 (N-p65) expression in prostates at 12 hours after LPS injection in 45-week-old PBS- or bortezomib-treated mice. C. Quantification of Bcl2l1 and Traf1/2 mRNA expression as a percentage of Hprt expression measured in microdissected mouse prostate epithelial cells by qPCR at 12 hours after LPS injection in 45-week-old PBS- or bortezomib-treated mice. Horizontal lines represent the average values. The p values were determined by two-tailed t test. D. Left panels: Representative images of TUNEL assays performed on prostates from PBS- or bortezomib-treated mice at 60 weeks of age. Insets show the apoptotic cells (green) in prostate glands. Scale bar, 100 祄. Right graph: Quantification of apoptotic cells in the ventral and dorsolateral prostates of PBS- or bortezomib-treated mice at 45 and 60 weeks of age. Horizontal lines represent the average values. The p value was determined by two-tailed t test. cKO, PB4-Cre4+Foxp3flox/y; wks, weeks; B/P, ratio of the mean value from bortezomib-treated mice to the mean value in PBS-treated mice. All experiments were repeated two times. Wks, weeks. Cancer Res 2015 75(8), 1714-24. Bortezomib (PS-341) purchased from Selleck. Immunofluorescence showing HDAC4 localization in mouse primary osteoblasts treated with vehicle or PTH alone or in the presence of bortezomib. Primary osteoblasts treated with vehicle, PTH, or PTH plus bortezomib for 2 h using anti-HDAC4 and anti-b-actin antibodies. 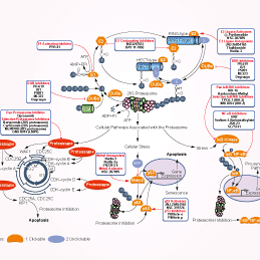 J Cell Biol 2014 205(6), 771-80. Bortezomib (PS-341) purchased from Selleck. Inhibition of proteasome and lysosome or silencing of VCP and co-factors lead to the accumulation of OP-puro-labeled DRIPs adjacent to or within SGs. HeLa cells were co-treated for 45 min with OP-puro and arsenite (Ars. ); where indicated, cells were pretreated with bortezomib (Bort.) overnight and/or ammonium chloride (NH4Cl) for 2 h 15 min. Cells were fixed and labeled with Alexa594-Azide and anti-TIA-1. Cell Death Differ 2014 21(12), 1838-51. Bortezomib (PS-341) purchased from Selleck. Oncotarget, 2015, 51: S659-S660. Bortezomib (PS-341) purchased from Selleck. Control wild-type and Fmn2–/–oocytes observed at different stages of meiotic maturation [prophase I (Pro I), NEBD, 3 hours and 8 hours after NEBD] using anti-Fmn2. wt + Bortezo, wild-type oocytes treated with 0.1μM Bortezomib for 90 minutes before fixation. All oocytes were observed using the same settings and the images treated the same way (three independent experiments). Red arrows indicate cortical labeling. Scale bar: 10μm. Development 2011 138, 2903-2908. Bortezomib (PS-341) purchased from Selleck. Cell viability of HCT116 cells treated with a single drug or with the addition of leucovorin. Sci Rep, 2017, 7(1):682. Bortezomib (PS-341) purchased from Selleck. Carcinogenesis 2010 31, 1948–1955. Bortezomib (PS-341) purchased from Selleck. Western blot of extracts of infected cells treated with different proteasome inhibitors at different concentrations, reacted with the indicated antibodies. p53 was used to monitor proteasome inhibition, and actin was used as a loading control. J Virol 2011 85, 2781–2792. Bortezomib (PS-341) purchased from Selleck. Time window treatment with proteasome inhibitors. (A) Scheme of the experiment performed with MA104 cells exposed to virus (OSU; MOI, 3) for 1 h and analyzed at the starting point and endpoint of the indicated time window treatments with DMSO, MG132, or bortezomib. (B) Western blot of cellular lysates derived from cells infected for the indicated time periods and treated with the proteasome inhibitors or DMSO. NI, noninfected cells. Blots were reacted with the indicated antibodies; p53 was used to monitor proteasome inhibition, and actin was used as a loading control. Fluorescence analysis of viroplasm formation on NSP5-EGFP cells infected with rotavirus (OSU; MOI, 3) and treated or not treated with MG132 (10 M) or bortezomib (10 M) at different times p.i., as indicated. Cells were analyzed at the starting points (1 h, 3 h, 5 h, 7 h) and endpoints (9 h) of the inhibitor’s window treatment. Quantification of the accumulation of viroplasms in infected NSP5 -EGFP/MA104 cells. At different times p.i., cells were treated for 4 h with DMSO or the indicated proteasome inhibitor and the number of viroplasms/cell was quantified at the starting (1 h, 3 h, 5 h; white bars) and endpoints (5 h, 7 h, 9 h) of treatment. PS-341 impairs FPV replication in A549 cells. (A and B)A549 cells were either pretreated for 1 h with different concentrations of PS-341 or with solvent only or were left untreated. Then, cells were infected with FPV at an MOI of 0.001 (A) or 0.05 (B). After virus inoculation cells were posttreated with different concentrations of PS-341. (A) At 24 h p.i. supernatants were obtained and progeny virus titers were measured by standard plaque assay. (B)Proteasome activity and the ability of PS-341 to inhibit the proteasome was determined 24 h p.i. (C) A549 cells were pretreated with 50 nM PS-341 or solvent or left untreated for 1 h. Afterwards cells were infected with FPV at an MOI of 0.0005. Subsequent to virus inoculation cells were posttreated with 50 nM PS-341 or solvent or left untreated. After the indicated times p.i.supernatants were obtained and progeny virus titers were determined by standard plaque assay. Arrow bars in all experiments represent standard deviations of three independent experiments. J Virol 2010 84, 9439–9451. Bortezomib (PS-341) purchased from Selleck. Early steps of viral replication within the first replication cycle are affected. (A) For time-of-addition kinetics analysis, A549 cells were either left untreated or were pretreated for 10 h or 1 h with 50 nM PS-341 before infection and additionally posttreated after infection. Cells were infected with FPV at an MOI of 0.005. After virus inoculation cells were posttreated with 50 nM PS-341. Then the proteasome inhibitor was added after virus inoculation (10 h, 1 h, and 30 min) or it was added at the different times p.i. as indicated (1 h, 2 h, 4 h, 6 h, and 8 h; cells were not pretreated before infection). At 9 h p.i. supernatants were obtained and progeny virus titers were determined by standard plaque assay. Shown is one representative experiment out of three independent experiments. (B) A549 cells were pretreated with 50 nM PS-341 or left untreated for 1 h. Afterwards cells were infected with avian FPV or human PR8 at an MOI of 1. Subsequent to virus inoculation cells were posttreated with 50 nM PS-341 or left untreated. After the indicated times p.i. cells were lysed and analyzed by Western blotting for accumulation of viral proteins polymerase PB1 and matrix protein M1. Cellular protein ERK2 served as a control to demonstrate equal amounts of protein loading. Shown is one representative blot out of three independent experiments. A549 cells were treated with PS-341 at 50 nM for the indicated times or left untreated. Western blotting was performed with total cell lysates, using phospho-specific antibodies against JNK and the transcription factors c-Jun and ATF-2 or loading controls, respectively. The stable cell line HepAD38 was incubated for 18 h in the presence of the indicated amount of Bortezomib. The medium was removed and replaced by medium containing Bortezomib dissolved in PBS. In case of the control cells the same amount of PBS was added to the medium. 4 h later this procedure was repeated and again 14 h later the supernatant was collected. The amount of viral particles was quantified by real time PCR. HBV-genome quantification was done using COBAS® AmpliPrep/COBAS® TaqMan® HBV test (Roche Diagnostics GmbH, Mannheim, Germany) according to the manufacturer’s instructions. The assay shows relative values (the value for untreated control cells was arbitrarily set as 1) that are based on three independent experiments. The cell viability was analyzed by MTT assays. For does up to 50 nM no significant effect on cell viability was observed within 18h, for 100 nM the proportion of metabolically active cells was reduced to 83%. J Biol Chem 2010 285, 41074-41086. Bortezomib (PS-341) purchased from Selleck. HLC-1 cells were treated with IFN-gamma (30 ng/ml) and Bortezomib (0-10 nM) for 3 h. After washing with PBS, the cells were cultured for another 45 h in the fresh medium. After 48 h incubation, PD-L1 expression was analysed by flow cytometry (n =3). 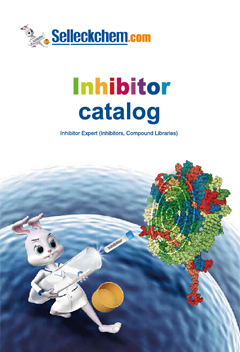 Int Immunopharmacol, 2018, 54:39-45. Bortezomib (PS-341) purchased from Selleck. Proteasome inhibition effect on biotinylation of MHC-Iα. (a) WB-ra of cellular extracts of HEK293 cells co-transfected with BAP-MHC-Ia and cyt-BirA (control) and, where indicated, with US2 or US11 in the absence (2) or presence of MG132 (MG; 50 μM for 4 h) or Bortezomib(Bort. ; 50 μM for 4 h). PLoS One 2011 6, e23712. Bortezomib (PS-341) purchased from Selleck. KKU-M213 was treated with BTZ as indicated. Total cell lysate ( a) and nuclear extract (b) were prepared. Actin and γ -tubulin were loading controls for total and nuclear proteins, respectively. 2011 Mireia Vila Gasull University of Porto. Bortezomib (PS-341) purchased from Selleck. Mireia Vila Gasull University of Porto. 2011;Mireia Vila Gasull . Bortezomib (PS-341) purchased from Selleck. In a typical kinetic run, 2.00 mL of assay buffer (20 mM HEPES, 0.5 mM EDTA, 0.035% SDS, pH 7.8) and Suc-Leu-Leu-Val-Tyr-AMC in DMSO are added to a 3 mL fluorescence cuvette, and the cuvette is placed in the jacketed cell holder of a fluorescence spectrophotometer. Reaction temperature is maintained at 37℃ by a circulating water bath. After the reaction solution has reached thermal equilibrium (5 minutes), 1 μL−10 μL of the stock enzyme solution is added to the cuvette. Reaction progress is monitored by the increase in fluorescence emission at 440 nm (λex= 380 nm) that accompanies cleavage of AMC from peptide-AMC substrates. The inhibitory effect of Bortezomib on cell growth is assessed by measuring MTT dye absorbance of the cells. Cells from 48-hour cultures are pulsed with 10 μL of 5 mg/mL MTT to each well for the last 4 hour of 48-hour cultures, followed by 100 μL of isopropanol containing 0.04 N HCl. Absorbance is measured at 570 nm using a spectrophotometer. Adams J, et al. Cancer Res, 1999, 59(11), 2615-2622. Boccadoro M, et al. Cancer Cell Int, 2005, 5(1):18. Stein RL, et al. Biochemistry. 1996, 35(13), 3899-3908. Hideshima T, et al. Cancer Res, 2001, 61(7), 3071-3076. On your website, it is mentioned that Bortezomib should be prepared at a concentration of 5 mg/ml in 2% DMSO/30% PEG300/ddH2O for in vivo use. But on the product sheet we received with the compound, it is mentioned: 5mg/ml in 0.5% methylcellulose, 0.2% tween 80. So which is the correct preparation buffer? S1013 Bortezomib in 2% DMSO+30% PEG 300+ddH2O at 5 mg/ml is a clear solution, and it in 0.5% methylcellulose+0.2% Tween 80 is a suspension. Please choose the suitable vehicle according to your administration route. When you prepare the clear solution, please dissolve Bortezomib in DMSO first, make sure it dissolves well, warm it up to 45 degree and/or sonicate if necessary, then add PEG, mix well, and finally add water.